There didn’t seem like there was much room for improvement, but the geniuses at Weber-Stephen Products LLC have done it again. Presenting – the new and improved Weber Smokey Mountain Cooker 18-1/2-Inch Charcoal Smoker. It features many changes that make a great difference in improving your overall smoking experience and is our favorite choice when it comes to charcoal smokers. One splendid design improvement is that the Smokey Mountain Cooker has a wider door for adding in charcoal or wood chips. While this may seem like a negligible change, it allows you to have a much easier time placing additional wood chunks or charcoal in an exact spot. You no longer run the risk of knocking over the water pan while trying to place a piece of charcoal in a particular location. The design of the door latch has also been improved on. This particular charcoal smoker now has a spring loaded door latch and a lever type handle, which makes the door a lot more secure. This offers additional safety to users of the Weber smoker. It will also be easier for you to tell, just at a glance, whether the door is shut securely. It’s a fantastic feature for those who are worried about inquisitive young children getting injured due to flimsy, insecure doors. Weber has also added in a pan at the bottom to catch the ash, which makes cleaning up that much simpler since you will no longer have to painstakingly sweep up the stray ashes on the ground. The Weber smoker comes in three major pieces which are incredibly easy to assemble, even for those who are clueless about smokers and mechanics. As for functionality, the smoker is remarkably able to maintain a consistent temperature, helping you to easily whip up a meal of succulent meats cooked to perfection. There is also a built-in thermometer so that you can monitor the internal temperature of the smoker, and a heat-resistant nylon handle that allows you to open and close the smoker without having to worry about burn injuries. Individual rust-resistant aluminium vents on the porcelain-enamelled bowl and lid give you greater control over the thickness of the smoke in the unit. With this, controlling the thickness of the smokehouse flavour in your meats becomes a breeze. The water pan adds steam to the process, keeping your food moist and tender. What can I cook in this charcoal smoker? This Weber smoker is equipped to handle all types of meat, ranging from poultry to salmon and even just good old hamburger steaks. It comes with two heavy-duty, nickel-plated steel cooking grates that give a combined 481 square inches of cooking space. As such, you can be assured that you will have enough space to cook anything and everything you will ever want to cook. In fact, previous users of this Weber smoker have reported that it was able to accommodate an entire turkey and a ham at the same time. But in the case that you do need additional space, Weber has different grates available for separate purchase that can help to create even more cooking space. Who is this Weber smoker suitable for? 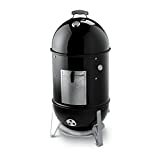 This smoker is superbly versatile, and able to cater to a variety of needs. If you want to have a cookout with a large group of friends, this smoker is definitely the one for you as it has the capacity to cater for large groups. On the other hand, it can also be used for a small family gathering. With superior insulation, the smoker is energy efficient and has a reasonable charcoal consumption level. The entire unit has dimensions of approximately 19 x 19 x 41 inches, which makes it small enough to be stored within the compounds of your home. As always, Weber-Stephen Products LLC offers a 10-year limited warranty with this charcoal smoker. In addition, with your purchase of the Weber smoker, you will also get to enjoy the terrific customer service available to all Weber customers. Their customer service associates ensure that all customers have access to any support they may need. This makes the Weber smoker especially ideal for those who are new to smoking, and who may need extra assistance with the setting up, use and maintenance of the smoker. So why not invest in the Weber Smokey Mountain Cooker now, and look forward to good times and good food.